Our financial planning know-how ensures your defined objectives can be met. We ensure that you have the correct assurance and risks in place. Retirement planning requires regular reviews to ensure sufficient capital is created. Preserving wealth through estate planning to safeguard liquidity in wealth transfer. We approach investment planning with accurate asset allocation for tax efficient portfolios. We have all heard the saying that “50 is the new 40”. Well this statement is becoming a reality, as people are now living longer. Being able to live longer is certainly favourable, however the consequences of the increasing life expectancy are adverse when one has not saved sufficiently for retirement. Longevity risk can be reduced through maintaining a sustainable level of income. With the constant advancement in medical technology, we are seeing that the life expectancy ages are increasing and this trend is likely to continue going forward. From the table above, we can see that the life expectancy has increased by 23 years from 1950 to 2014 (an increase in life expectancy of 1 year per approximately every 3 years). It is also important to note that the stated life expectancies in the table above do not necessarily apply to individuals who have access to advanced technology, medicine, healthy foods and reside in a healthy environment. Many people living in an emerging market do not live the emerging market lifestyle, therefore we need to look at the life expectancy of people who live in a developed country. Currently, the age at which you can claim from your state pension in the UK is 65 for men and 60 for women. According to an article by This is Money, between October 2018 and October 2020, both men and women’s state pension age is expected to increase to 66. It is further expected that between 2026 and 2028, it is likely to rise again to 67. As a result of the increased life expectancy, people are now opting to work longer to ensure that they have enough funds for retirement. This is illustrated by the average retirement age currently being 65 for the above mentioned first world countries. This is concerning as the current average retirement age in South Africa is age 60 as reported by Trading Economics. Will this pose a future challenge for South Africa? The United States Census Bureau states that there were 4 447 people over the age of 100 living in the US in 1950. By 2001, the number had grown to 50 454. By 2050, the number is expected to be 834 000. Dr Graeme Codrington, an expert on the future world of work and the disruptive forces that are shaping it, has shared future trends that support longevity. He states that exceedingly more people are living longer and, therefore, there is a need to change the way we currently view retirement. He further stated during a recent keynote presentation that the person who will live to 150 years of age has already been born. Governments in some countries are resorting to increasing the official retirement age as they can no longer afford the pension commitments. According to research done by Discovery Health, it is expected that Japan will increase their official retirement age from 65 to 67. They have also implemented incentives for people retiring after age 65, such as an increased monthly pension payment. Living longer places a greater strain on our ability to save for a comfortable retirement. It is important, especially for us, as South Africans, to then plan for longevity as we save for retirement moving forward. The return on your investment is lower than that required to provide a sustainable income for life. Assuming an inflation rate of 6%, the above table illustrates that the higher your percentage drawdown, the quicker your investment capital depletes. It is important to note that even if your portfolio achieves the required level of real returns over time, undisciplined drawdowns can drastically reduce the investment capital, and therefore your future level of income is reduced. 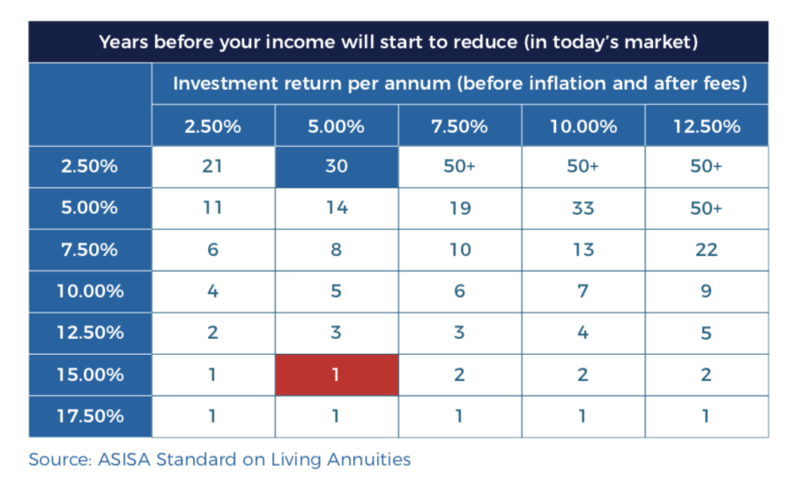 For example, if you were to draw an income of 2.50% from your living annuity capital and the portfolio achieves a return of 5.00% per annum, your income in today’s money will start to reduce in year 31. Now if you decide to draw an income of 15.00%, with a return of 5.00%, the level of income will start to decrease after only a year. This illustrates that your selected percentage drawdown is critical to the sustainability of your income. William Bengen submitted research in 1994, titled “The Four Percent Rule.” The research indicated that a 4% draw on capital could provide a sustainable income and preserve capital. This theory was further confirmed by three professors of finance at Trinity University in 1998, who enhanced the studies of William Bengen with the aim of determining “safe withdrawal rates.” The professors revisited the study in 2006, and increased the “safe withdrawal rate” to 4.5%. Importantly, this is a rough rule of thumb and should not be applied blindly to different individual circumstances. Ultimately, a sustainable level of income will ensure that your capital lasts longer, catering for a longer retirement period. It is important to make the decisions about how you will manage your finances in retirement well before you actually retire. 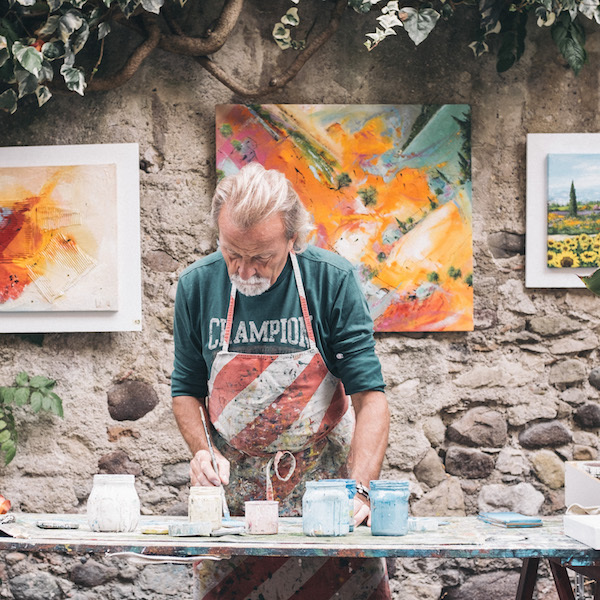 Retirement planning is a matter of understanding that you are deferring income you are earning now in order to have income to spend in retirement. Living longer means you need to save more now, in order to sustain your desired level of income throughout your retirement. It is crucial to then defer the correct amount of income, invest it responsibly, retire at an appropriate age and consider your income drawdown at retirement, all taking into account how long you may live. Trusts have recently come under the spotlight from a SARS perspective. With the recent amendments, it is important for a trustee to fully understand their role and responsibilities. With the end of the 2019 tax year fast approaching, it is important to ensure you are making full use of the allowable contributions to both Retirement Funds and Tax Free Savings accounts prior to the end of February 2019. Do we need to worry about Trade Wars? The primary reason that countries engage in protection is to promote the economic strength of the home country, including employment, often at points when the global economy is weak, or when there is rising competition from foreign participants. Through stronger local industry a country becomes less reliant on imports from foreign nations, providing a stronger base from which to direct its own growth policies. News and views from Industry leaders.